India 499 (Shikhar Dhawan 187, Murali Vijay 153, Virat Kohli 67*, Peter Siddle 5-71) and 4-136 (Virat Kohli 34, Cheteshwar Pujara 28, Xavier Doherty 1-24) beat Australia 408 and 223 (Phillip Hughes 69, Mitchell Starc 35, Bhuvneshwar Kumar 3-31, Ravindra Jadeja 3-35) by six wickets. The determined team India let down their strong rivals Australia in the third back to back home Test with a wide margin and proved their strength in the game. The Kangaroos piled up 408 runs in their first innings followed by 223 in the second. India amassed 499 in the first and achieved the nominal target of 133 by smashing 136 runs in 33.3 overs with six wickets in hand. Shikhar Dhawan (India) was declared ‘Player of the match’ for his outstanding knock of 187 on debut in the first innings and for sharing a match winning opening partnership of 289 with Murali Vijay. The third Test of the four match series concluded on Monday, March 18, 2013, at Punjab Cricket Association Stadium, Mohali, Chandigarh. Earlier, the Aussies begun the day at 3-75 in 21 overs while Phillip Hughes and Nathan Lyon were unbeaten for 53 and 4 runs respectively. The latter got a four in the first over and they scored just three runs in the next three overs as Lyon was dropped by Virat Kohli at slip off Pragyan Ojha in the next over. He was gone in the 28th over for 18 at the total of 89 and was replaced by the Australian skipper, Michael Clarke who hit a couple of fours in the 30th over. Hughes was playing a subdued innings and could not add any run to his overnight score for the next 23 balls he faced. Hughes hit his first boundary in the 35th over as the pair wanted to play off the day that resulted in a defensive approach and the scoring rate was almost dead. The home bowlers delivered quite a few maiden overs as Clarke was caught by Cheteshwar Pujara off Ravindra Jadeja for 18 at the total of 119 in 46 overs. Phillip Hughes followed him four runs later at 69 off 147 balls with 1 six and 11 fours. The Kangaroos lost two more wickets and they were in trouble at 8-143 in 55 overs when Mitchell Starc joined in with Brad Haddin. The two batsmen started the battle as Starc was dropped by the Indian captain, MS Dhoni, behind the wickets off Ojha at six runs. The pair kept on creeping with the assistance of a few boundaries and took the score to 179 when Haddin was declared leg before wicket for 30. Starc scored a well fought 35 as the entire Australian team was bowled out for 223 in 89.2 overs. Bhuvneshwar Kumar and Ravindra Jadeja were the supreme bowlers with three wickets each whereas Ravichandran Ashwin and Pragyan Ojha shared two each. India required 133 runs to win the match as their second innings was opened by the attacking young guns, Murali Vijay and Cheteshwar Pujara. 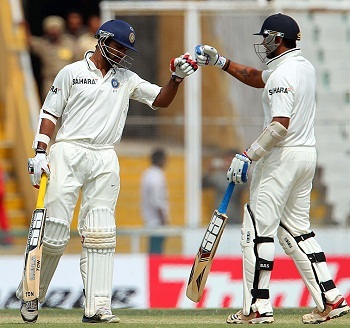 Vijay hit 2 fours in the very first over and Pujara got his first boundary in the fourth over. They kept on cruising towards the target as Vijay added another 2 fours in the 9th over and the score reached at 42 in 9 overs. Murali Vijay was stumped smartly by the wicket keeper Brad Haddin off Xavier Doherty for 26 on the second ball of the next over. Virat Kohli got together with Pujara next and they hit 4 more boundaries in the following overs. Cheteshwar Pujara became the next victim when he was held lbw for 28 off 51 with 5 fours. The entire stadium erupted when the little master, Sachin Tendulkar, walked in next and scored four runs in the even balls he faced. 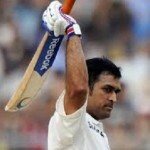 The batsmen did not take any risk and went past the hundred runs mark in the 26th over. 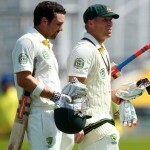 Virat Kohli was caught at midwicket by Michael Clarke off Peter Siddle for 34 on the fourth delivery of the next over. Dhoni walked in next as the Australian fast bowling duo of Mitchell Starc and Peter Siddle bowled excellently and made it difficult for the batsmen to score the remaining 30 runs. They added just eight runs to the total in 30 balls as Tendulkar hit a four in the 32nd over. He ran himself out in the next over as Ravindra Jadeja hit 2 fours in the 33rd over and eased the pressure on the home side. MS Dhoni changed his gears in the 34th over and achieved the target by hitting three straight fours. India scored 136 runs for the loss of four wickets in 33.3 overs whereas Dhoni stood firm at 21 assisted by 8 by Jadeja at the other end. Peter Siddle, Nathan Lyon and Xavier Doherty were the only successful bowlers with one wicket each. India triumphed in the third Test by a big margin of six wickets and the fate of the match was decided in four days since the first day’s play was washed out because of rain. 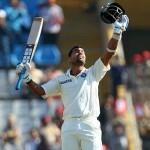 India took a commanding lead of 3-0 and has already won the four Test series. The final game will commence from March 22, 2013, at Feroz Shah Kotla, Delhi.